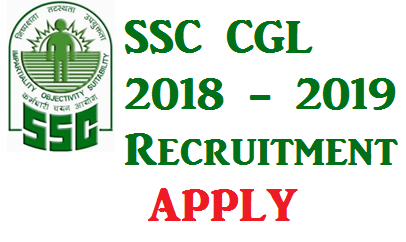 Candidates looking for SSC CGL 2018 - 2019 Recruitment ? Now you have a good news as Staff Selection commission (SSC) has published an recruitment for the Combined Graduate Level (CGL) Examination 2018 - 2019.All the eligible and interested candidates can apply online for the Group B & Group C Posts from the day of advertisement.Every year, this exam is held by SSC at various centers all over the country. Lakhs of candidates appear for this examination as it is one of the main and popular exam among the graduate youth of India. Candidates can apply for online registration for SSC CGL 2018 - 2019 from link given. For more details regarding pay scale, education qualification, exam date etc can read the notification below. Upper Division Clerk in Central Govt. Offices/Ministries other than CSCS cadres. Minimum qualification for the post will be Graduation from any of the recognized university/institutions. The minimum age limit for the SSC CGL will be between 18 years to 27 years as posts required. There will be age relaxation in upper age limit for reserved category candidates according to government policy. Note: The Date of Birth will be mentioned as in Matriculation Certificate. No other date of birth will be acceptable by the staff Selection Commission. Tier I: Examination consists of written examination (Objective MCQ). Tier II: Examination consists of written examination (Objective MCQ). Tier III: Examination candidates have to face personality test, interview, and computer proficiency test and document verification etc. Selection will be made through the written exam and Interview. How to apply online for SSC CGL 2018 - 2019 ? Then fill all the details of the form. Now make payment online or offline mode. Attach recent size photograph and sign. Take the print copy for the future use. Last date: for Part 1 and 2018 for Part 2. Candidates apply online and register themselves for SSC CGL 2018 - 2019 recruitment on or before 2018, For further updates regarding SSC CGL 2018 admit cards and results keep visiting our page for updates. we would be providing with study materials for our readers. Candidates are requested to like our official Facebook page for updates. For any comments, queries regarding SSC CGL 2018 - 2019 Recruitment comment below.